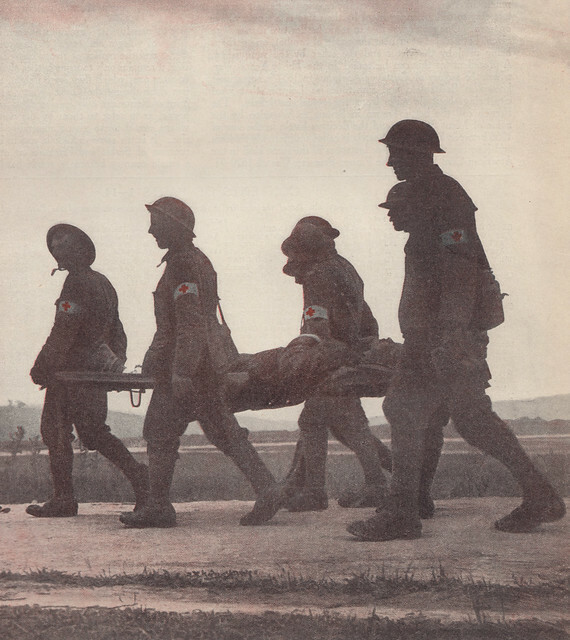 This is a hand-tinted image from the 1930s which adds a lot to this wartime photograph of a group of Stretcher Bearers carrying in a casualty on the battlefield. 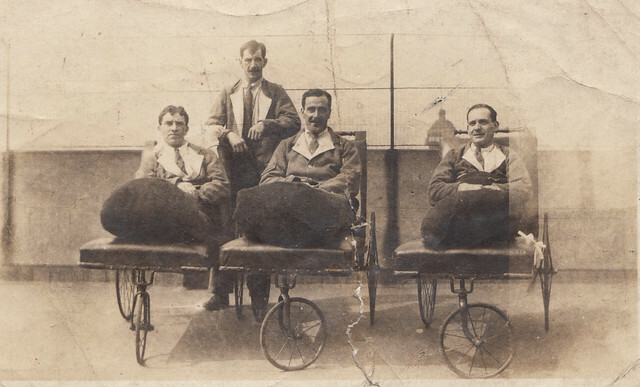 There were two types of Stretcher Bearers (SBs) in the Great War; Regimental SBs and those in the Royal Army Medical Corps. 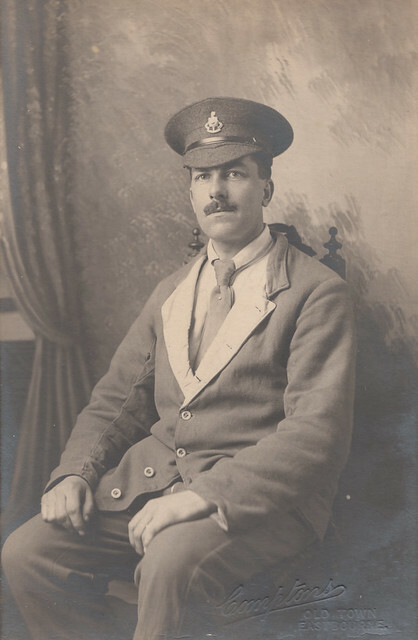 The ones at regimental level were in infantry battalions; traditionally in peace time these men were part of the battalion band and were musicians as well as SBs, but following the formation of Kitchener’s Army in 1914 that gradually began to change and men were selected for the aptitude rather than their ability to play an instrument, with the medical training coming second. Regimental SBs were the first port of call for battlefield wounded; they would search the battlefield for casualties and take them to the Regimental Aid Post for treatment by the RMO – the Regimental Medical Officer – usually a Lieutenant or Captain from the RAMC. From here they would be taken to a collection point where SBs from the RAMC would take over and transport them back to the nearest Advanced Dressing Station (ADS) or Main Dressing Station (MDS). The weight of a wounded man was something to be reckoned with and while in pre-war training SBs practiced in pairs, the reality on mud-soaked battlefields was that it would take more personnel to evacuate each casualty even on relatively good ground; as illustrated here. As Indian units began to engage on the battlefield in Flanders and Northern France in 1914 they suffered casualties. The dead were cremated or buried on the battlefield according to religion and when that was possible, and the wounded were evacuated to Britain for treatment in a number of hospitals. One of the best known was the use of the Royal Pavilion at Brighton, which were rapidly turned into an Indian War Hospital in the autumn of 1914. Indian soldiers died here and those whose beliefs dictated it were cremated on the Sussex downs above Brighton. 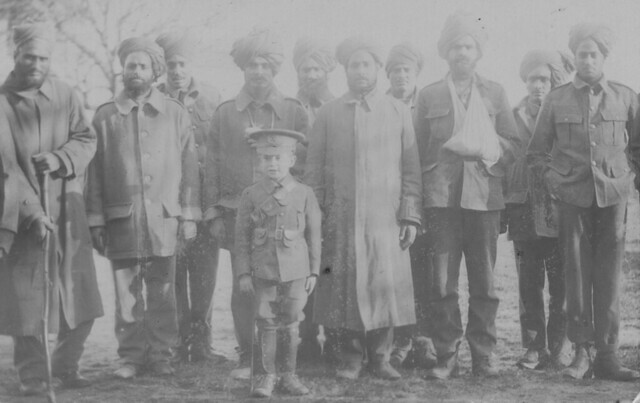 Today the Chattri remembers them and is the scene of an annual service of remembrance for the men of the Indian Army. This image I purchased in a Brighton junk shop more than thirty years ago. The old man who sold me it remembered the Indians as a boy in the town, and like other parts of Britain there was great local interest in these Indian warriors; stories of them filled the local newspapers. In this photograph walking wounded are out in one of the local Brighton parks and local people have come out to see them, including the young boy in front, dressed in a soldiers uniform just as no doubt his father was at the front. Men of these men in the photograph were back in the trenches a few months later taking part in the Battle of Neuve-Chapelle.